Farah Fawcett and Paul Newman projected the quixotic energy, the eternally hopeful personality and the unique face shape of Aquarius. These traits are more apparent in persons who have an Aquarius Moon or Ascendant, or multiple components that aspect Uranus. Aquarius Sun Signs mimic the nature of Fixed Air. The Air gives them a seemingly translucent flesh and an effervescent personality. The fixed forces give the face the appearance of a funneling cloud, gathering into the center. Thusly, the face shape is altered, as the facial features are compacted in from the edges. This makes Aquarius’ head appear large and out of proportion. Within this face, you’ll see the small, square tipped nose, the tightly drawn smile and the dimpled, square jaw. This sign usually has inflated eyelids that tilt in from the sides. It gives the impression that their lids are blinking inward. These physical feature are unique, and it makes Aquarius one of the easiest to detect. This fixed air enables these friendly souls to focus on “the ideas inside their heads”–or on some point far out in space! Since Aquarians are able to tune into the collective consciousness of their abundant array of friends, they have a gift for knowing what everyone is thinking. That is why they are so intuitive! The funnel of winds generates a lot of electricity. Sporadically, this often results in a shocking discharge of electricity. In their mannerisms, these six Aquarius celebrities often display gestures that mimic the qualities we see in the mix of Fixity and Air. All the while, they exhibit the physical traits, face shape and personality of Aquarius. Here, we will also illustrate how the different astrological components in these celebrities alter the nature of their Aquarius Suns. These “bearers-of-light” are the communicators and social gadflies, who sparked the collective consciousness of humanity with their inventive ideas and revolutionary thoughts. 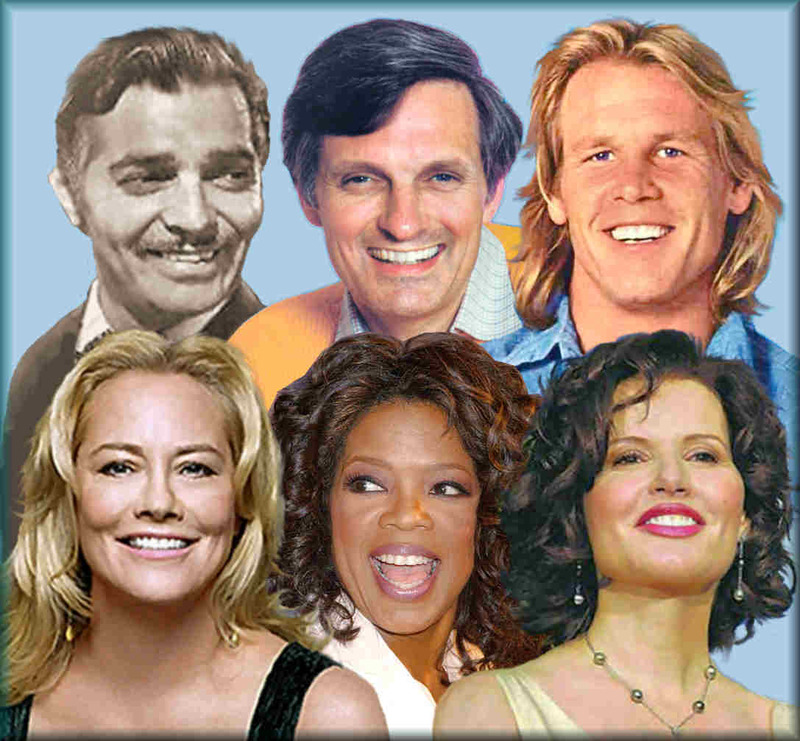 Oprah Winfrey and Alan Alda got attention for their friendly and intuitive natures, and their gifts for communicating with others–a talent often seen in most Air signs. With their verbal skills and alternative thoughts, they both inspired all of humanity. Aquarius Sun’s Clark Gable and Gena Davis won fame for their unwavering and focused mental presence. They often seemed to dwell in the alternative world, imagined in their heads. Cybil Shepherd and Nick Nolte struck us as being rebellious and erratic. They often surprised us with their quirky revelations and oddball views of the world.